Just over ten years ago, we first met Billy Gorter, Founder and Executive Director of This Life Cambodia (TLC) in Siem Reap, Cambodia. We still remember his excitement and enthusiasm when he first told us about how he was approached by members of a community just outside the centre of Siem Reap who had big dreams of starting a community centre in their village. ‘I told them to come back to me when they had something to show,’ he said. And so they did. Impressed by their initiative, Billy’s initial thought was to help writing a project proposal to seek funding for further development, but it did, however, become apparent for Billy that communities and small grassroots organisations needed more than just project proposals. There was little focus on community-level capacity building and training in Siem Reap, and after a chance conversation with a local boy who was living in a pagoda to get education from the monks after dropping out at school in grade six, Billy decided that he would try to help this boy and others in similar situations to get an education and fulfil their dreams. Over the years, we’ve discussed current issues related to tourism and development and we’ve worked with Billy in different capacities, including sourcing locally made hand-crafted products to provide conference guests. 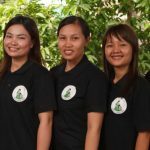 HOPE has been supporting This Life Cambodia Internship prorgramme whereby young adults from the rural countryside are selected to work with This Life Cambodia’s team and gain invaluable work experience in the office. HOPE has also been supporting This Life Behind Bars programme in order to ease reintegration for children and young adults in prison into their communities by providing vocational and life skills training and strengthening family connections by facilitating family visits. We’re impressed with the commitment and engagement, and today, ten years later, TLC has grown into an award-winning community development NGO with seven programs focused on three practice areas: Children & Families, Education as well as Community Research and Consultancy. Sharing many similar values, Billy explains that they believe that the path to a poverty free Cambodia is founded on building community-level capacity, and that working in partnership with local government entities is the best way to achieve sustainable and lasting change. They aim to bridge the gaps that exist by building capacity at a grassroots-level, and their approach to development enables communities to develop the essential knowledge and skills needed to make change and break free from poverty. The team at TLC has also recognised that local communities are the experts when it comes to identifying practical ways to achieve improvements in their daily lives, and working side by side with community residents, listening to their insights and acting on their input, we wish Billy, Se and all the TLC staff the very best in the future and successful years to come! This Life Cambodia is a community development organisation based in Siem Reap, Cambodia, with a vision for vulnerable children, families and communities in Cambodia to be supported to access and create opportunities in this life. For more information and how to support their work, please visit their website and Facebook page. Fuelled by a passion for responsible travel and flavoured by the rich and varied history and culture of the Mekong region, Mekong Experiences consists of a small but dedicated team of responsible tourism enthusiasts with years of hands-on experience from the tourism and hospitality sector. With a few passport stamps of their own, they have a balanced view of what works well for travellers and what doesn't, and put great focus on responsible travel, tourism and hospitality practices with the aim to help develop, communicate and promote responsible travel products, and travellers to find unique travel experiences. Where are all the bicycles? Copyright © Mekong Experiences 2008 - 2018. All rights reserved.